The type RS3-3L Dual Drum Rack Storage unit has been designed to rack up to three drums on each of two racks 740 & 1540mm above floor level. 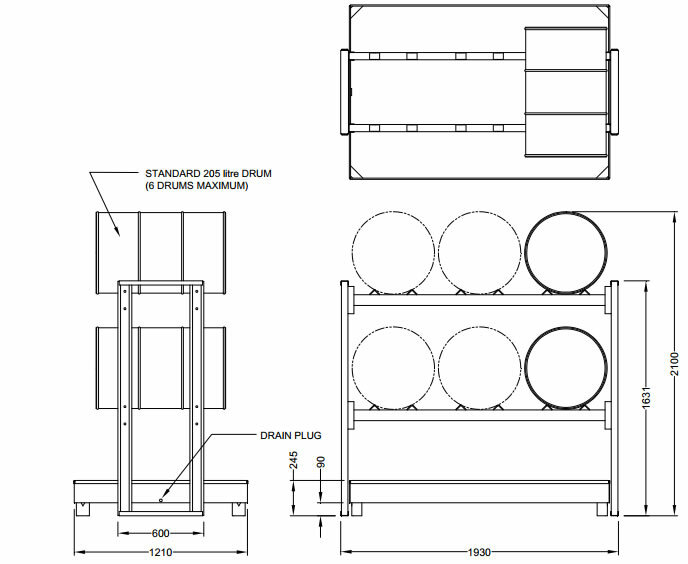 The Drum Rack Storage unit comprises of a stand alone drum rack and a spill containment tray to provide a safer working area by protecting against chemical spills. In the advent of a spill, the tray may be removed without disturbing the rack, and emptied by removing the drain plug provided. 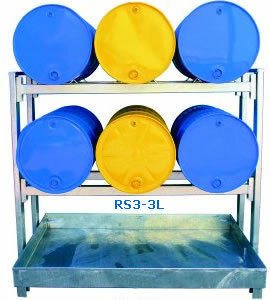 The Unit Weight of the type RS3-3L Dual Drum Rack Storage unit (including the tray - type SP6 Spill Bin) is 130kg. All Drum Racking systems come in a long life Zinc plated finish.